The Wicked Witch Callistra’s emotions are in turmoil. On the one hand, she has raging feelings of jealousy because she believes she is the most powerful witch and should have been crowned Queen instead of her daughter. On the other, she nurses a conflicting instinct to help her daughter. She also wants to maintain new friendships. Which desire will win through? David and Richard may have tricked her into revealing the list of ingredients needed to mix the Happiness Potion, but is she ready to oppose her daughter and support them with their quest? David, Richard, a reluctant Princess Helen and Callistra set out to collect the ingredients for the Happiness Potion. When their journey does not go smoothly, they struggle against the powerful forces of magic pitted against them. David may have sidelined Draconia, but will his spell hold? Has she wriggled free of his influence so she can continue to interfere? Is the powerful witch Callistra deliberately leading them astray? Or are there other forces at work which they cannot control? In one reality, where people can enter but cannot leave, Sir Richard finds someone dear to him and his family. They have the freedom to do whatever they want, but with no means of escaping, will they be forced to remain in paradise forever? Or are they trapped in a living hell? Sir David believes he knows the way home, but with so many in their party, will they all remain focused and stay together? Can our adventurers avoid being waylaid and return Princess Helen safely to her homeland? Or will they be diverted again by the powers of darkness or by David’s desire to find and help the Jade Princess? Can our adventurers discover the truth about the antidote and how to prepare and use it? Will they be able to cure the feelings of sadness and despair gripping their world? Can they overcome the forces of magic pitted against them or will they continue to follow false and misleading paths? 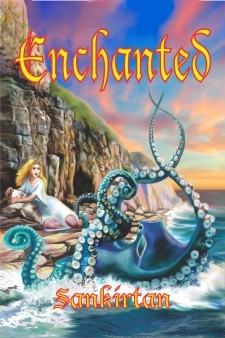 Follow the adventures of David, Richard and Princess Helen in Enchanted to discover the real truth behind these great mysteries and find out what stops them from reaching their goals.